Dr Marc's Blog: String Quartets - must they change? Created by four former players from the Singapore Symphony Orchestra, the T'ang Quartet has made something of a reputation for itself for, as its own website puts it, "pushing the boundaries of classical music". It attempts to change the function of a string quartet from that of a static, formal and fundamentally introspective ensemble to something which is highly extrovert, highly mobile and, if not informal, very different in its performance style. It dispenses with black and white attire and replaces it with jeans, trainers and ragged tops. They often stand up to play and move around as they do, introducing an element of visual drama to their performances. My first reaction is; why? The string quartet medium as we know it has become what it is for very good reasons and its repertoire is built around the assumption that this is what a string quartet is. Of course, the T'angs get around that by mostly commissioning new work (predominantly from Asian composers who, it is assumed, are less ingrained in the traditions of a string quartet). When audiences go to a string quartet they know what to expect and go there with their eyes open; I've yet to hear of anyone turning up at a string quartet recital by accident, as it were, expecting something both exciting and visually dramatic. It fills a very clear and obvious niche and, for its audience, it does it well. Some string quartets are good and some are bad, some attract big audiences, some can barely muster a quorum, some make their performances musically exciting, some bore the pants off you. But that's the nature of the beast. The T'angs' website also tells us that they believe "in the power of music to change lives". Well and good. So do I. But do you have to change the whole concept of a tried and tested medium to do that? For a time, especially in the middle years of the 20th century, the piano was the bête-noir of avant-garde composers. With its roots in the very traditions of western art music, it was the symbol they all wished to destroy. (And there's really fascinating piece on the net about this; http://www.scrapclub.co.uk/texts/piano-destruction-text#7). I'm not sure that the string quartet ever came in for such stick then and, clearly, it is not the intention of the T'ang Quartet to change the concept of a string quartet by destroying it. But I wonder if they are doing it merely to force the musical world to accept them – it is, after all, a field which is pretty well saturated and only the most exceptional musicians can gain wide recognition – or whether they really think that there's something wrong with the string quartet which needs to change. In short, are the T'ang Quartet simply trying too hard to be different in a field where audiences neither want nor accept that change is necessary? Of course, music must always been developing and advancing, but might not the most effective developments come from trying out new combinations of sounds, new ways of producing music, rather than from simply taking something which already works very well and attempting to alter it? The great thing about classical music is that it has built up traditions over the years which are accepted and enjoyed for what they are, while it is at the same time creating new and different sounds from new and different types of ensembles. I admire the T'angs as players, but I'm not sure I wouldn't rather they broke out from the string quartet and pushed the boundaries in regions where boundaries are ripe for pushing. 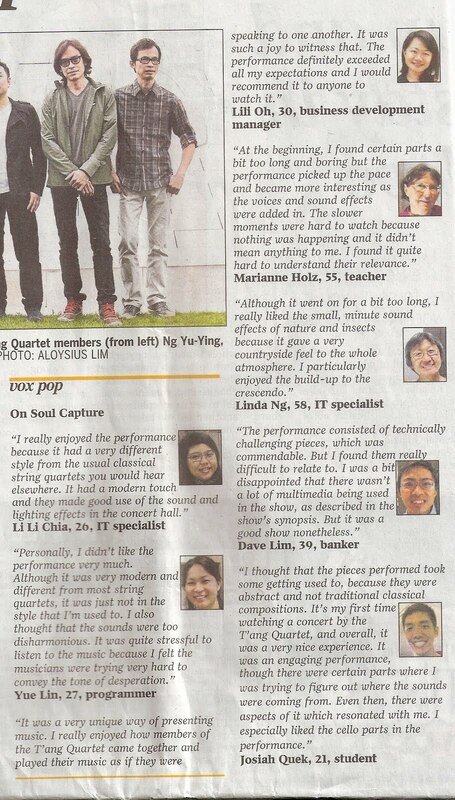 Here's my review, an edited version of which the Straits Times published on 2nd June 2011. On to a stage littered with various lumps of wood and bathed in a golden autumnal glow, the T'ang Quartet surreptitiously crept, scraping and hacking at their instruments as they came. It was a visually and aurally effective moment, the first of many in what was an intriguing if ultimately puzzling performance. Marcia Tan's stage production was imaginative, and while what appeared to be hollowed-out pumpkins - leftovers from last Hallowe'en - seemed mildly incongruous, a gong dominating the stage like some majestic setting sun was an inspired idea. There was also excellent lighting and a cleverly integrated tape comprising sampled and reprocessed sounds – as well as a persistent and irritating hum, but that might have been down to the air conditioning. The members of the T'ang Quartet have a real flair for the dramatic gesture, and throughout the performance they showed intense physical involvement. When two of them started crashing cymbals and uttering increasingly animated vocalisations, the others became visibly more frenzied, creating a powerful aural and visual climax. Relying solely on playing their instruments for effect, however, they seemed decidedly awkward, the cellist in particular, writhing about stiffly as he drove himself through a long but flawed solo. Much of the music may have been improvisatory, but the coordination between them was nothing short of masterly. As for the music, it neither trod new ground nor pushed the boundaries. Mostly it rehearsed clichés which were all the rage in the 1960s - but as he was only born in 1976, composer Hu Xiao-ou can be forgiven for perhaps thinking them cutting-edge. He was at his most inspired when he shook off western pretentions and simply rejoiced in cleverly-contrived Chinese sounds. 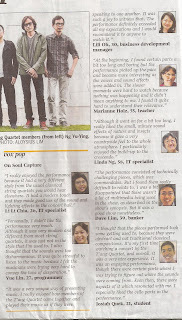 Through it all the T'ang Quartet produced playing of impressive assurance. It would be good to offer some kind of explanation as to what each of the sections in Hu's score was trying to convey. Unfortunately, in an act of unbelievably crass idiocy, someone had decided to print the essential programme notes over a photograph of dense woodlands, the result being that only isolated letters could be discerned amongst a mass of leaves and branches. It was a case of not being able to see the words for the trees.